Thread: Early Frontier Artwork for Arbormon, Mercuremon, Ranamon, Fairymon, & More! 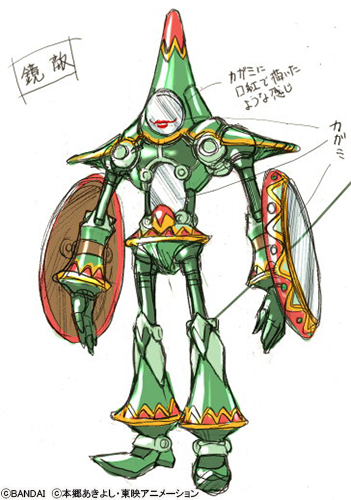 The artwork for Arbormon has nothing 'super' interesting as it's his final design, but seeing it a bit rougher than the finalized artwork we are used to is nice. 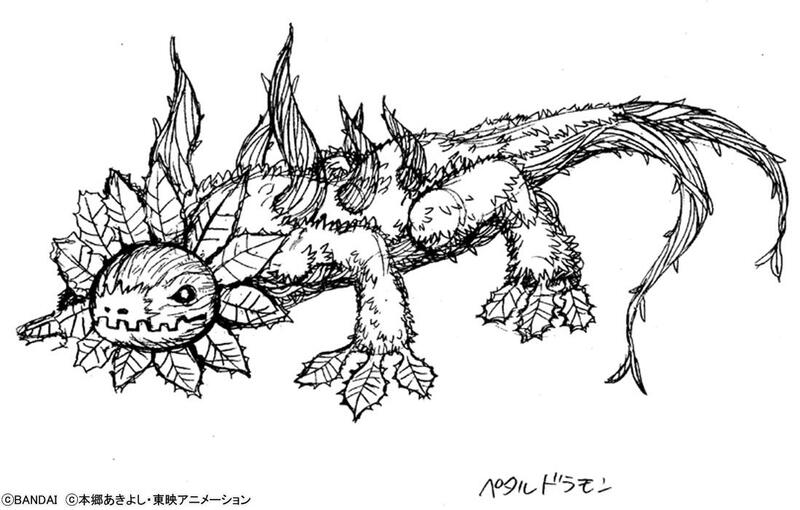 Then we get to see Arbormon's beast spirit form, Petaldramon. The artwork itself is rough linework for Petaldramon's profile artwork. Mercuremon! Again, nearly finished art. 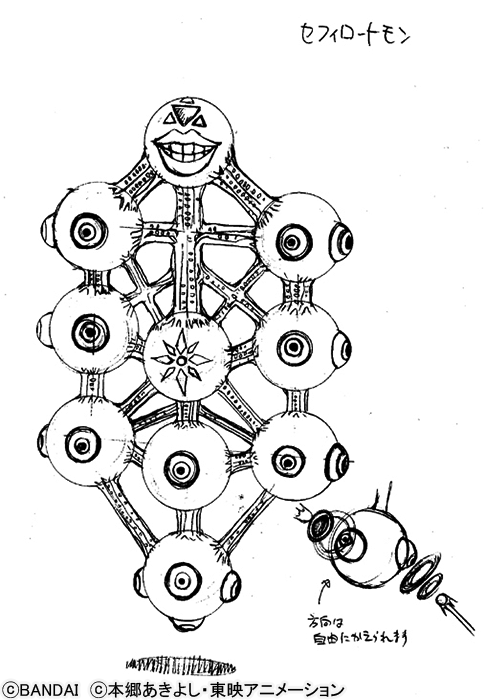 This sketch appears to have been used to make 2 Mercuremon cards later- as a CGI render with ST-704 and as finished art with BO-108t. This rough drawing of Ranamon appeared to have been the inspiration for the CGI render used on card ST-706. 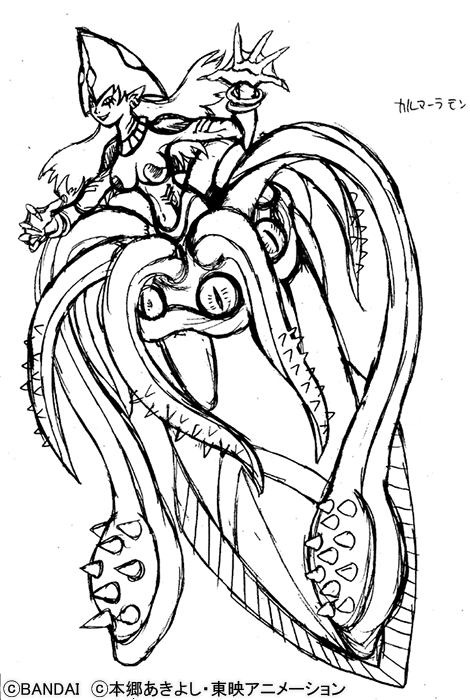 This rough linework of her beast spirit, Calamaramon, was eventually finished and used on her first card, BO-735. 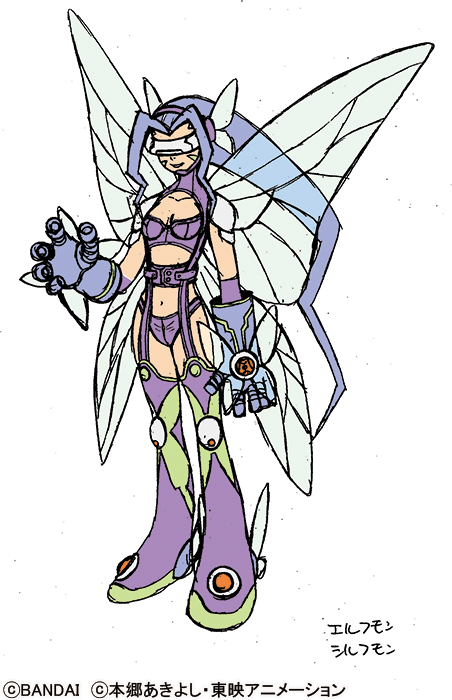 This rough artwork of Fairymon appears to have not been used, but based on the general appearance, likely was a rough, or an inspiration, for the artwork that ended up being her profile art. It also mentions that early potential names for Fairymon were Elfmon and Sylphmon. Marsmon! Who isn't in Frontier itself... but was part of that generation of Digimon and he was in the D-Scanner, so I guess they are including him with an asterisk. 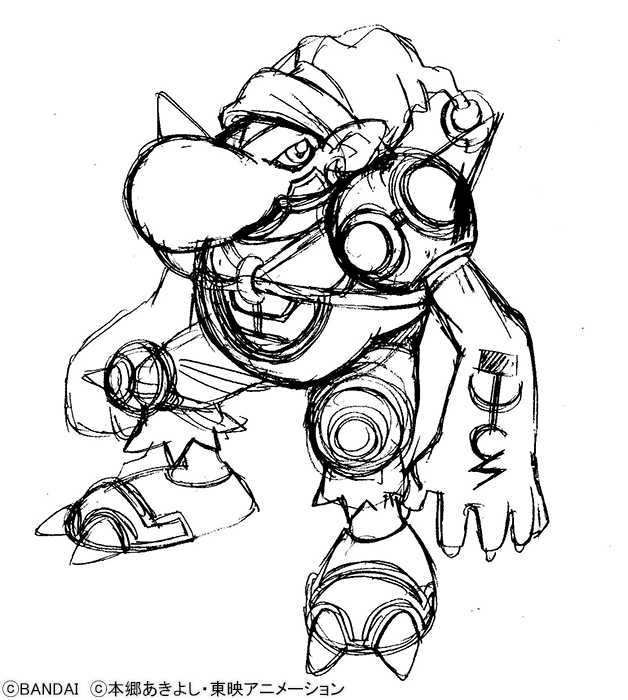 This image is a rough of what later became his profile artwork. Plus we get to find out an early potential name they had for him was Berserkmon. It's Grottemon and his beast spirit form, Gigasmon! He possesses power over Earth from one of the legendary Ten Warriors. Both roughly have the same design in their drafts as their final design. 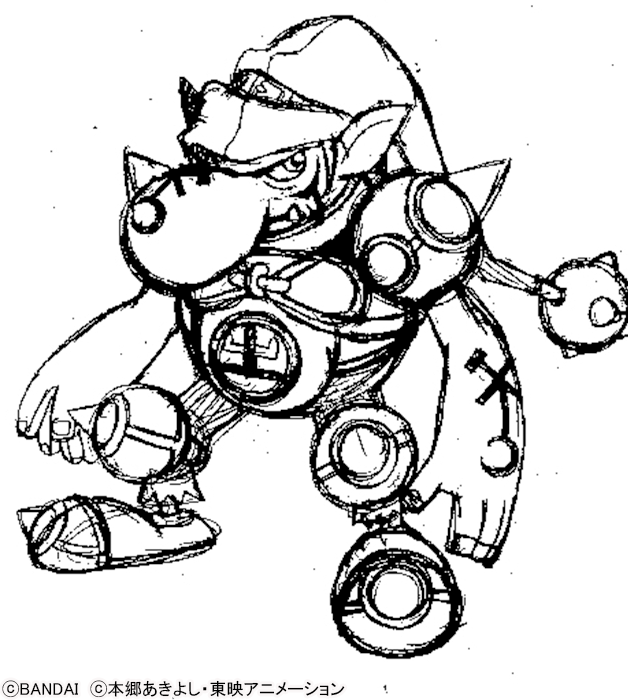 The primary change they note was that they changed the design of the mark on Grottemon's arm. It's a rough design they pulled up of a 'dead' (unused) character. They think this rough looks cool, and they comment that they think it's a waste that this wasn't used. Cool to see so much at once, and I'm sure they could just reuse that design at any point now that it's in the open lol, just give it a name and then tell the game staff, or anime staff, to use it since it's (probably) a complete design. Also slightly funny is that the Twitter translate on the horse photo says "it's a good time to be killed". Now Loweemon will be revealed soon for sure. 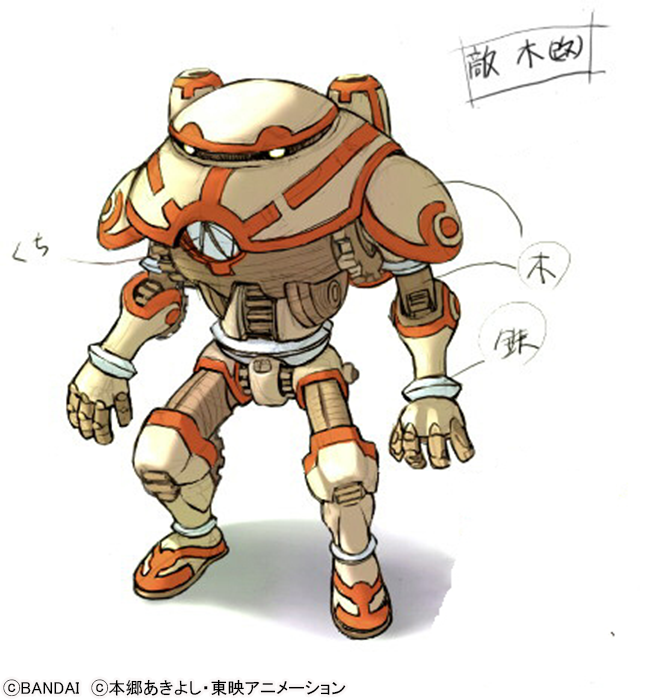 Many of the early warrior designs were probably still influenced by the that futuristic sentai tournament concept that Frontier was imagined as in the very beginning but when they honed in on the plot and aesthetic that they ended up using it makes sense that later designs had less of an extreme experimentation phase. So most of them have just very minimal tweaks. Glad they didn't use the weird centaur design. 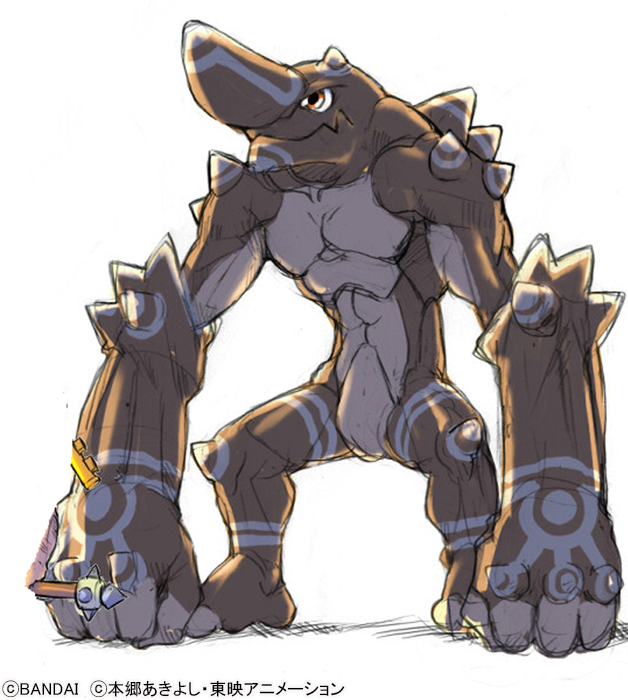 It would somewhat work as some strange Maildramon evolution but in general it kind of lacks cohesiveness. 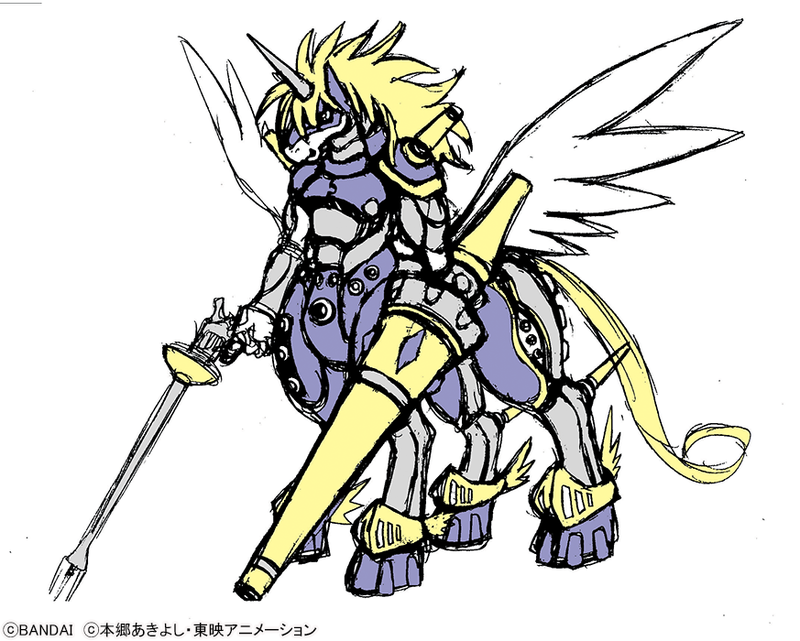 By now we got a much better semi-winged centaur-ish design with Sleipmon and his right lance design has been reused for Examon. It was probably the other way around, with of the Olympos Twelve not really existing when he was first designed. 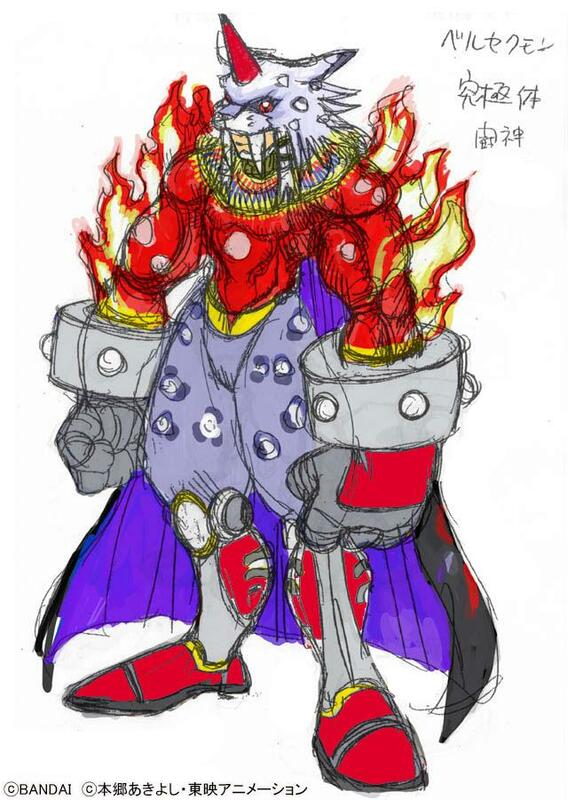 The design itself is after all not exactly very indicative of mythology (Mars was afaik never overtly associated with panthers and the general gist of his profile "oh well, he's good at fighting" could be applied to any Ultimate Digimon anyway). the part about frontiers original plot is a good point though. As is the maildramon connection. You can see it in its feet. Oh, wow, that horse is amazing! Fits well in my Patamon - Centalmon - Pegasmon line as the final stage. I hope we get to see more of these! This yeatr has been so good for concept art. I love seeing this stuff in videogames and movies but I never thought we'd see so much for Digimon. 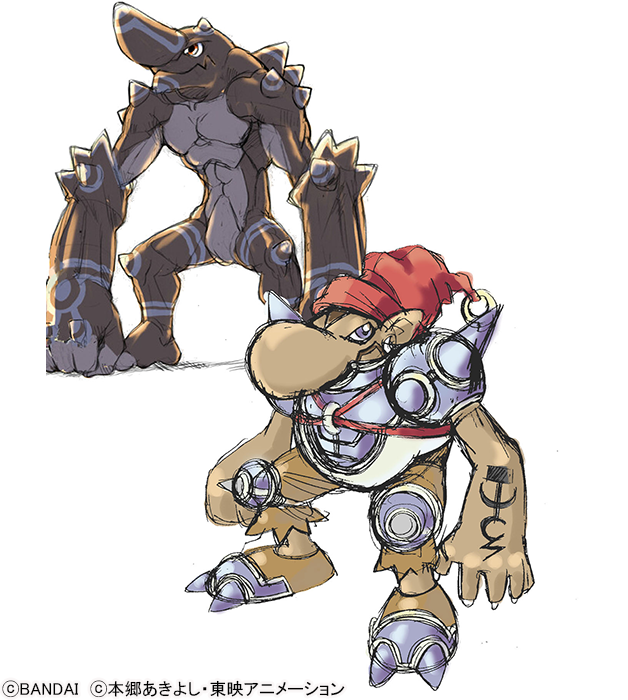 I've even seen some fanart of proto Chackmon on Twitter! I hope this centaur gets fanart . He looks like he'd be perfect for Patamon, who evolved to Unimon, Centaurmon, and Angemon in various stuff and he looks like all 3 pwith Seraphimon colours. I love that style of gun because of Captain Harlock too, and it looks like Captain Hookmon's. I love that horse Digimon so much. I don’t suppose I could convince them to reintroduce it could I?